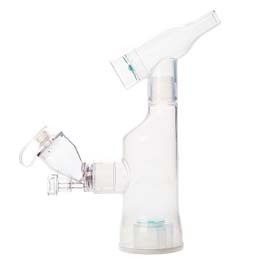 The Aerogen Ultra is an accessory specific to the Aerogen Solo nebulizer. It facilitates intermittent and continuous nebulization and optional supply of supplemental oxygen to pediatric and adult patients via mouthpiece. The device can alternatively be used with a facemask, which is not provided. It is a single patient use device which can be used for the delivery of solutions, suspensions, proteins and peptides at all stages of patient care.